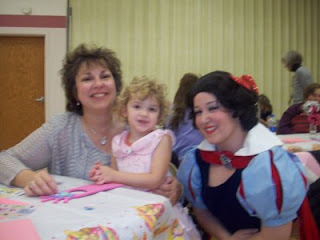 So, Saturday, my mom, Rori, and me went to a Princess Party at the Community center. Rori dressed in her sleeping beauty dress, my mom wore the dress she wore to my wedding, and I got as dressed up as I could manage. My mom went all out--I'm pretty sure she's a princess at heart. She bought sparkles for us to wear in our hair, and jewel stickers to put on our faces. Rori thought my mom looked so beautiful. (and she did). Ariel, Snow White, Belle, Cinderella, and Tinkerbell were all there. It was amazing to see Rori in awe of the princesses. 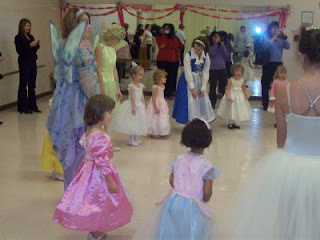 She was very serious as they learned their princess dance. She didn't crack a smile. She desperately wanted to dance with Ariel, but she ended up with Belle, so Baba Hoo Hoo, who will do anything for her grandchildren, asked Ariel if she would dance with Rori. 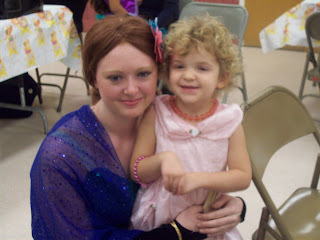 The whole time that Rori was dancing with Ariel, she was beaming and in awe. Unfortunately my stupid camera was acting up so I didn't get any pictures of that, but I did get some of her earlier. I can't wait for her to go to Disney and see the awe and wonder of meeting the princesses there. awww, it looked like fun. everyone looked beautiful. i bet mom sure loved it maybe even more than rori rose. I think my favorite picture is the last one, with all the moms circling the circle, snapping pictures. :) How fun!!! I can't wait to do all these girly things with Juliet. How fun for all 3 of you! Mom looks as beautiful today as the day I married her 36 years ago.